In addition to the splash of colour provided by ‘Copper Beech‘, the yellow gorse stood out as a bit of colour in a rather colourless landscape. 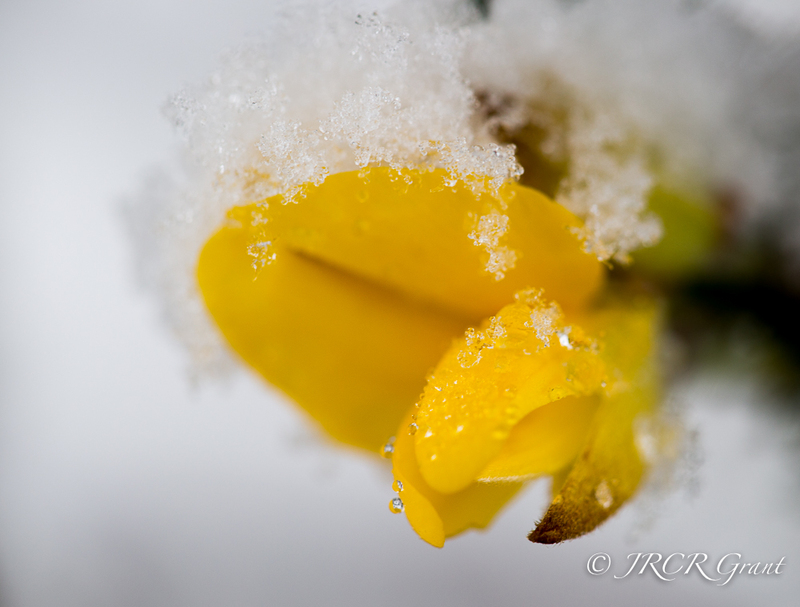 Here its petals may be shrouded in snow crystals, but the yellow still bursts through. After a couple of comments last week I have decided to extend the snow series into this week. At the end of the series I will post a gallery of all the shots and ask that you select your preferred image. Hope the week gets off to a cracking start. Great juxtaposition John, Winter and Spring in one shot! Commonly called whin bushes up here. So eye-catching MM! Great shape and colour, brave brightness in winter. LOve the strength of nature that you’ve captured here John. The gorse defying the snow and ice crystals that are attempting to smother it. Beautiful. Such a gorgeous pop of yellow! The picture is gorgeous and I really do love that kind of yellow!!!! Gorgeous photo. Gorse prevails through it all! Good thanks and plenty of gorse!